April 18th 2017 was the bid presentation deadline for the largest construction lot for the Brenner Base Tunnel, Pfons-Brenner. 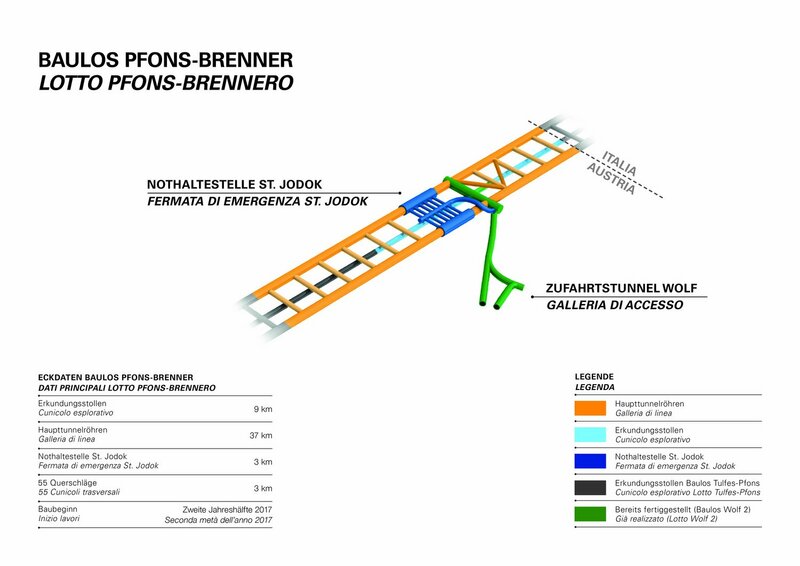 The construction lot includes the excavation of the main tunnels between Pfons and Brenner, about 9 km of exploratory tunnel and the emergency stop and the cross-over at St. Jodok. In total, about 50 km of tunnel will be driven. The qualitative criteria are currently under evaluation. Once this phase is complete, the price bids will be opened in a public hearing. The Austrian CEO of BBT SE, Prof. Konrad Bergmeister, considers this tender procedure as a further important milestone for the construction of the Brenner Base Tunnel, since over 80% of the works for the tunnel have now been tendered. Six years ago, on April 18th 2011, Phase III - the construction phase of the tunnel - was launched. So far 61 km of tunnel have been driven, which is about a fourth of the total volume of excavations.